The Egyptian parliament said Friday that Britain’s new report on the Anglo-American invasion of Iraq provides good reason to put George W.Bush and Tony Blair on trial as war criminals. The Egyptian parliament’s Committee on Foreign Affairs called on Friday for George W. Bush and Tony Blair to be tried as war criminals, saying the resounding report of a British committee investigating Britain’s participation in the war against Iraq clearly shows that there were no convincing reasons for the conflict. “This British committee’s report – the Chilcot report – has exposed the false reasons which former US president George W. Bush and former UK prime minister Tony Blair had exploited to wage their illegitimate war against Iraq,” said the strongly-worded statement. The parliament said that the American-led war in Iraq left more than one million Iraqis killed and millions more wounded, internally displaced or sent from their homes as refugees. 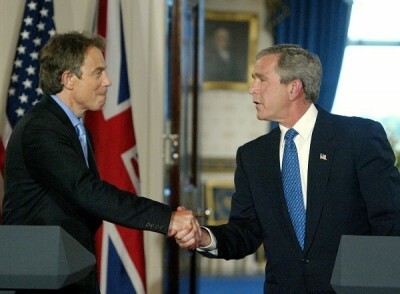 “There’s no question that George W. Bush and Tony Blair should be put on trial as war criminals not only because they are the ones who trumpeted the reasons for this war, but also because they should be held responsible for the deaths of millions of Iraqis since 2003,” the statement read. It singled out former US president Bush as the Iraqi conflict’s foremost war criminal. “Bush committed his crimes in Iraq amid silence in America which claims itself as the land of democracy and human rights,” the statement noted. According to the statement, the British report on the war also exposed the ceaseless Western conspiracies against the Arab World, the Middle East and the Arab Gulf. “These conspiracies aim at plundering the riches of this region, enslaving its peoples and plunging them into constant troubles,” said the statement. The committee recommended that the Arab League and the next Arab Summit in Mauritania this month issue strong statements against Western military intervention in the Arab World and to use its influence in the United Nations to espouse this principle.